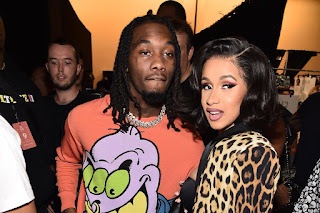 Celebrity Couple, Offset and Cardi B who parted ways in December, 2018 have been reportedly back together as husband and wife. Offset who has been doing everything to win his heart back with expensive gifts, loved up vacations, and spontaneous appearances at her shows has eventually succeeded. According to a reliable source, Cardi B has moved back into the Atlanta matrimonial home that she and Offset shared before the breakup. Allegedly, this is the first time she's been back to stay in the home with Offset and Kulture since December. Cardi has been teasing the makeup online for weeks now, by claiming she misses Offset. TMZ reports that Offset changed his phone number to prove to Cardi that he isn't taking calls from any other women. The phone is strictly for Cardi and business calls. Allegedly, a "no groupies" rule has also been applied to Offset, who will have to avoid his eager female fans for the sake of his relationship.